The City Club of San Francisco filled to capacity on March 6th for EWIP’s fifth-annual Women’s Leadership Conference. This event is fast becoming a “must attend” for content-minded women. It has earned this reputation by drawing smart women who are passionate about publishing, media, and technology and the desire to direct the impact it has on their lives and careers. The signature all-female roster creates an air of inspiration, intelligence, ambition, and seems to unleash a license upon the crowd to speak openly. The dozens of on-the-ground industry stars in attendance seriously belies the alleged difficulty other organizers claim, in “finding women” to present at their events. The panels here are packed with talent. Not everyone welcomed all parts of the program. Some women fled the room as the communication exercises led by Social Fluency began. They had everyone standing up, staring into the eye(s) of a stranger which had this writer fidgeting and sweating through too many uncomfortable moments. However, those few minutes surprisingly, paid off for me. It deepened our interactions, so by the end of the day I had a new-found friend. There were numerous occasions for making connections occurring all day, with lively conversations about the topics most of us cared about. Corporate executives, digital media producers, founders, editorial directors, mixed freely with the everyday blogger, technology geek, designer, or J-school student. The diversity inherent in the connections amplify and strengthen an industry that requires many serial commas to describe. 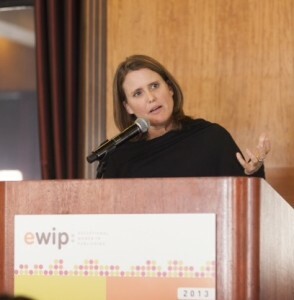 At the award luncheon, Dwell Media, president, and last year’s EWIP Award honoree, Michela O’Connor Abrams introduced the 2013 award recipient, Deanna Brown, CEO of Federated Media. Ms Brown, who announced her decision to leave Federated Media, just last week, took the opportunity to share with the capacity crowd some of her thoughts on the value and importance of storytelling and voice in the digital universe. She read selected quotes from some favorite examples, as a prelude to a brief description of her next venture, Digital Scouts, a talent agency for creators. Rose Aguilar, host of Your Call, KALW gave a spirited talk about her experience breaking into radio and reporting on social issues. She spoke of the importance of defending feminism (women are people) and encouraged the audience to write more op/ed pieces and speak up often. Citing the dramatic losses in the US of reproductive rights, and the significant impact homelessness and poverty has on women, as reason enough to use the media to affect social change. Read more from eContent magazine reporter, Nancy Davis Kho. If you attended, the organizers want to hear your thoughts about the conference. Click here to take a brief survey.